Learning to play a musical instrument can be overwhelming at first, especially if you see other people playing with so much ease that it seems second nature to them. Even famous musicians started from zero, so you always need to keep your chin up and keep going. In this article, we have tried to come up with what we consider to be the most essential and fundamental beginner ukulele chords to learn and master, in order to progress and ultimately become a competent ukulele player. If you’ve always wanted to play music, the ukulele is a great instrument to start with. 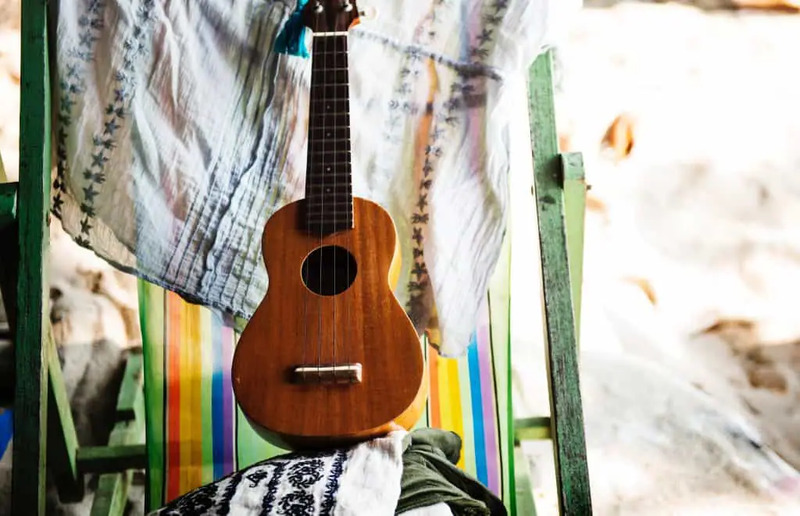 Its small size makes it a handy instrument you can take along and play anywhere, and because the uke only has four strings, you won’t have a hard time playing your favorite tunes right away. It’s definitely one of the simplest and most enjoyable instruments a novice can learn. You can get started by learning the basic ukulele chords that are perfect for beginners. Of course, it’s important that you learn on a well-made, quality ukulele. There are many great options out there for beginners, even those on a limited budget. Learning to play on a quality instrument right from the beginning will help you train your ear to the correct tuning, and you won’t have to constantly re-tune your instrument. It will make learning easier and motivate you to keep going. First, let’s start with understanding how a ukulele is tuned. The standard tuning of a ukulele is G-C-E-A, with the string closest to your chin being the G string and the one at the bottom being the A string. 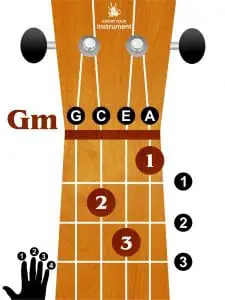 The sequential order of the strings is counted from the bottom going up, which means the A string is the first string, the E string is the second string, the C string is the third string and the G string is the fourth string. If your ukulele is not tuned properly, the chords and notes will sound terrible and you won’t enjoy playing. You’ll hear that the notes you play don’t match what you’re listening to. You may even think that you’re a horrible player and perhaps the uke is simply not for you, when all along it’s just because the instrument’s tuning is way off base. It’s important for beginners to develop the habit of tuning their ukulele before playing. The easiest ways to make sure the ukulele is in tune is to use an electronic tuner, an online tuner, or a ukulele tuning app. When tuning, pay close attention to the sound. Eventually, you will learn to tune your instrument by ear, which is a great skill to have especially if you forget to bring a tuner when you go out with your uke. Ukulele chord charts or chord diagrams show four vertical lines, with each line representing a ukulele string. 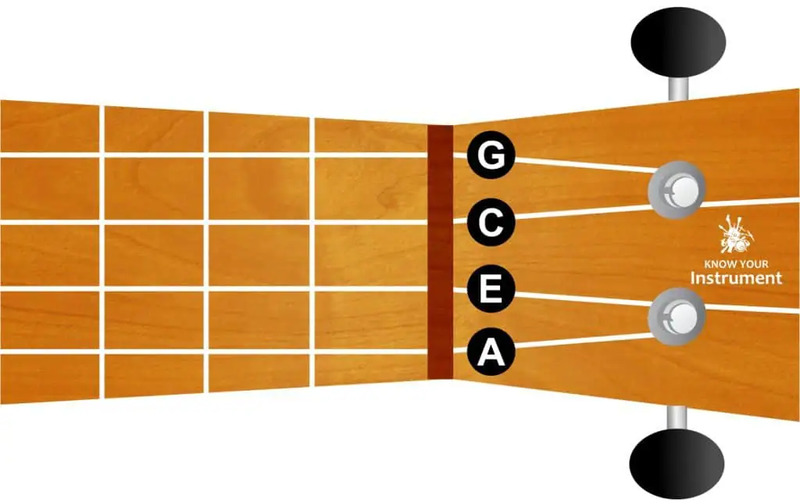 The first, or leftmost vertical line represents the topmost string on the ukulele (G string). Imagine you are looking at the ukulele’s fretboard with the headstock on top. The horizontal lines represent the frets on the neck of the ukulele. The top horizontal line is usually thicker or marked by a double line. This line represents the guitar’s nut. If the chord diagram shows frets higher than the fourth fret, the top horizontal line will not be in bold or marked by a double line. You will see numbers at either the left side or the right side. 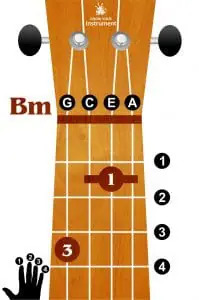 These refer to a particular fret number when a chord is played higher up or beyond the fourth fret. There are also black circles or dots on the lines on the chord charts. A dot on the string means this should be fretted, or pressed down to the fretboard using a finger. Some chords may show a “0” or “o” at the top of some strings, this means these strings are played open or are not to be fretted. Some chord charts also indicate which finger to use for fretting by putting numbers inside the dots. “1” represents the index finger, “2” is for the middle finger, “3” indicates that you should use the ring finger and “4” represents the pinky finger. The thumb is rarely used for fretting, but if you see a “T” inside the dot, that means you would be using your thumb to fret. Our ukulele chord charts follow this mark up method. Chord diagrams may also show finger placements (or “fingerings”) at the bottom, or between the chord name and the nut mark. You may also see an “x” at the top of a string. This means that it should be muted, or not played at all. This can be done by touching one or more fingers of your fretting hand on the string without pushing it down or fretting it. Barre chords, which are chords that are fretted using one finger at the same time, is noted on a chord diagram by a solid or curved line running through a fret from the first note of a chord to its last note. It can also be represented by a series of black dots in the same fret that have the same finger number. We have chosen to use a solid line and have also indicated which finger to use in the middle of the line. Chord charts also indicate if the chord is a minor chord with a lowercase m. This means that a chord written as “Cm” is a C minor chord. 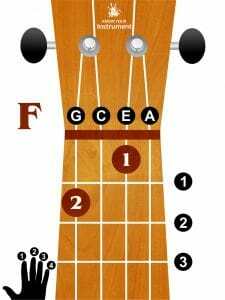 There are many ukulele chords that may be considered easy or basic because you would only need one or two fingers for fretting. However, some of those don’t get used that often, so we are focusing on ukulele chords that are not only easy for beginners but also useful for playing a variety of tunes. You can start with the commonly used ones written here then try the other ones as your playing skills develop and your musical taste expands. Also, it should be noted that some chords have other versions, which means they can be played using other finger placements. We are going to show the easiest way to play those chords and you can learn the other chord variations later as you progress in your ukulele-playing. When playing a ukulele chord, it’s important to push the strings down to the fretboard at the same time, not one at a time. To make it easier for you to do this smoothly, practice by making the chord and getting your fingers used to the shape of the chord. Then, lift your fingers off the strings at the same time, then put them back down again to play the chord. 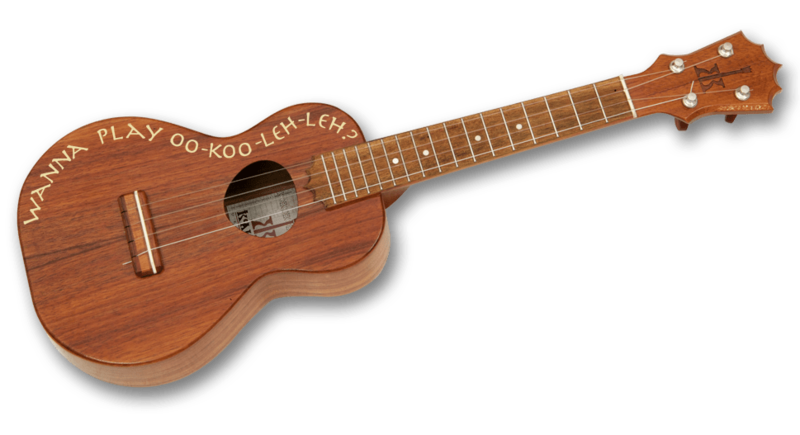 Strum the ukulele and listen closely to how the chord sounds. Do this until your fingers “remember” the shape of the chords and you can identify the chord by ear. Over time your fingers will develop muscle memory, and you won’t have to consult chord charts all the time and look at the fretboard to check if you’ve placed your fingers on the strings in the correct position. In this ukulele chord guide for beginners, “Finger 1” is your index finger, “Finger 2” is the middle finger, “Finger 3” is the ring finger and “Finger 4” is the pinky or the little finger. Fret 1 is the one closest to the nut. Fret 3: Position Finger 3 on the bottom string (A string). Fret 2: Use Finger 2 to fret the G string. Fret 1: Use Finger 1 to fret the E string. Fret 2: Use Finger 2 to fret the G string. Arch your fingers to avoid touching the C and A strings when you reach over to get to the E and G strings. Keeping the C and A strings open can take a bit of practice but you’ll get the hang of it! Fret 2: Place Finger 1 on the C string and use Finger 2 to fret the A string. Fret 3: Position Finger 3 on the E string. Fret 1: Position Finger 1 on the C string. Fret 2: Use Finger 1 to fret the A string. Fret 3: Place Finger 2 on the E string. Fret 4: Put Finger 3 on the C string. Fret 2: Place Fingers 1, 2 and 3 on the G, C and E strings. Fret 2: Use Finger 2 to fret the G string while fretting the C string with Finger 3. This will leave just the A string open. Fret 1: Use Finger 1 to hold the G string down. Fret 2: Put Finger 2 on the A string. Fret 4: Use Finger 4 to fret the C string. Fret 1: Use Finger 1 to press down on the C string. Fret 2: Use Finger 2 to fret the G string and Finger 3 to fret the E string. Fret 2: Position Finger 1 across the C, E and A strings and press them down together (barre chord). Fret 4: Put Finger 3 on the G string. Other chords for beginners to learn…. Fret 3: Use three fingers on the C, E and A strings or place the length of Finger 1 across those three strings at once (barre chord). Fret 1: Position Finger 1 on the A string. Fret 2: Put Finger 2 on the C string. Fret 3: Use Finger 3 to fret the E string. Fret 1: Position Finger 1 on the E string. Fret 2: Place Finger 2 on the C string and use Finger 3 to fret the A string. Fret 1: Place Finger 1 on the C string. Aside from chord diagrams, another popular way to learn the finger placement chords is to know their shorthand. Remember that the vertical lines on a chord diagram represents the ukulele’s four strings, G-C-E-A? And that a 0 on top of the diagram means an open, or unfretted string? Those principles are used in shorthand chord names. Let’s take for example the C chord. As a review, this is made by putting your ring finger on the first, or the A string at the third fret. In shorthand the C chord would be 0003. 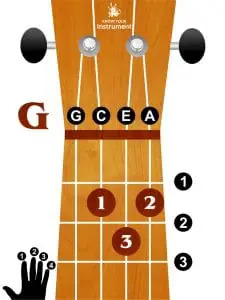 This means that strings G, C and E are not fretted, but A is fretted at fret 3. Another example is the C7 chord, which you make by putting your finger on the bottom or the A string at the first fret. In shorthand, C7 would then be 0001. Since it’s at the first fret, you would hardly need to use your middle, ring or pinky finger there, and it would be natural to use the index finger for fretting. Other examples of shorthand chord names: A is 2100, G7 is 0212 and A7 is 0100. Shorthand chord names are a good way to remember where a chord is fretted but you still have to determine which finger to use for fretting. Don’t worry – this will be easy enough to work out once you know how to make chords. In each of your playing goals – playing faster, learning new chords, composing a simple melody – have patience with yourself and don’t rush. Muscle memory takes time to develop, especially in beginners hold an instrument for the first time. It’s normal and don’t be too hard on yourself when you feel like you’re not making any progress. To track your progress and motivate you to keep playing, keep a daily practice log. Write down what you’ve accomplished for the day, say practicing chord transitions (moving from one chord to the next) between the C and F chord. If you can, record a video of yourself playing every day. We’re sure that your Day 30 video will show your improved your skills since Day 1. Recording a video of yourself playing can also help you observe yourself and see what you’re doing wrong so you can make improvements. Maintain good form and posture. Make sure you are sitting comfortably when practicing and you’re not slouching. Good posture also prevents unnecessary strain in your muscles and joints. Practice chords using a metronome (a physical one, an online metronome or a mobile app). Start with a slow pace then increase the speed or tempo steadily as you become more adept at playing chords. For instance, play the F chord at 65 beats per minute (BPM) for 1 minute, then take 15-second break, then play the chord again. Repeat this twice before moving to the next chord. After playing the chords for 65 BPM, increase the tempo to 70 BPM, then 75 BPM, and so on. If the song your want to learn plays at 85 BPM, start with a slower pace and build up until you are playing the song at 85 BPM. When you’re learning to play a song, it helps to listen closely so you can hear where the chord changes happen. When making chord transitions, it would help if you anticipate the next chord and prepare your fingers by hovering them over the strings they should fret. Let’s take for example the C chord. When you play it, only your ring finger is fretting, leaving your index and middle fingers free. When you need to transition to an F chord from a C chord, you can prepare your index and middle fingers by hovering them over the strings they need to fret (E string at the first fret, G string at the second fret). This way, your fingers don’t have to travel far when you change chords. If it’s your first time playing a string instrument, making the chords may feel awkward or uncomfortable to your fingers. To help you get used to playing, include finger exercises as part of your daily practice to increase the reach of your fingers and let you play faster and longer. Remember to strum with your wrist and not with your arm because moving your arm up and down repeatedly will tire you out quickly. It’s all in the wrist! Take breaks and allow yourself to develop muscle memory. Allow your brain and finger muscles time to record your motor activity and make it easier for you to come back to the movement easily without that much conscious effort. This goes not only for making chords but for strumming as well. Hum the lyrics or melody. If you’re learning to play a song, it would be helpful to hum along while practicing. This will help improve your strumming and keep the right timing while allowing you to get used to using your vocals. As you get better – you’re in tune, on time and can transition between chords easily, you can move on to singing the lyrics while playing effortlessly! Another thing to love about the ukulele is that it gives off a relaxed and chill vibe. It doesn’t feel like a “formal” instrument like the harp or the cello. So when playing the ukulele, it’s best to stay loose and relaxed, not only in your fingers, wrists and arms but your entire body, especially your shoulders and your back. You can maintain good posture without holding yourself too stiffly, which can result in you getting tired quickly. Watch ukulele videos, listen to different music genres, play along with ukulele music, discover alternate fingerings – all of these contribute to you becoming a better ukulele player. Don’t stop with with just the basics; let your motivation drive you to learn more about playing the ukulele. 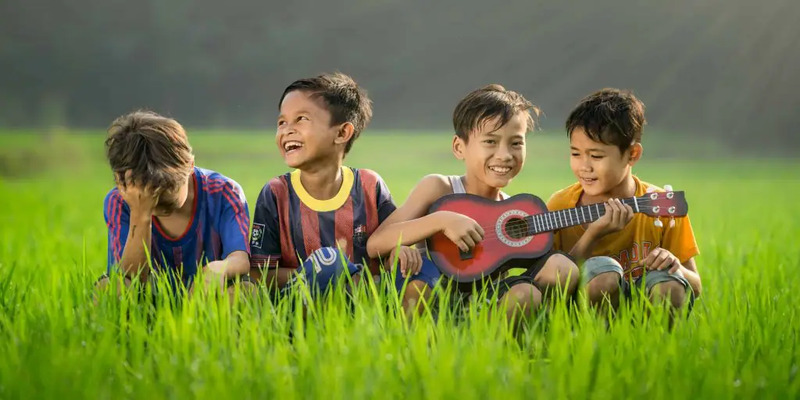 Jam with your friends, try to compose your own song (or even a simple melody) – do whatever makes you motivated to learn and simply keep going! Here are some of the easiest ukulele songs for beginners. These songs use the chords we’ve listed above. Remember to start slow and have fun! Once you’ve got those songs down, you can try your hand at playing other beginner-friendly songs. There are plenty of ukulele tabs for these and other songs online – simply do a search to find your favorites! We hope our ukulele chord explanation for beginners helped out. All that’s left to do is for you to pull out your uke and get practicing. Practice does make perfect after all!